There are few things more satisfying to a palate than fall off the bone bbq ribs. It takes time to cook a rack of baby backs the right way. 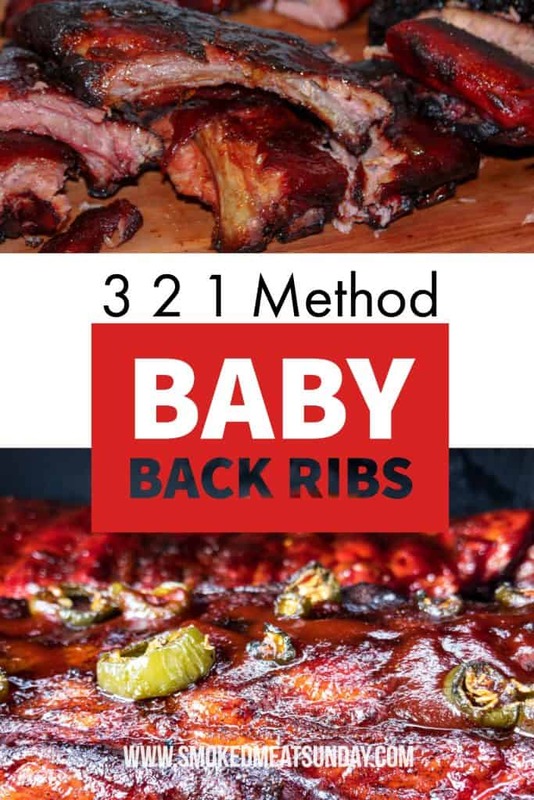 I’ve tried smoking bbq baby back ribs several different ways and my favorite is the 3 2 1 method. Today I’m going to share with you how I cook 321 Method Peach Peach Baby Back Ribs. I grew up eating a lot of wild game so my first memory of incredible barbecue was during my freshman year of college in Gunnison Colorado. There was a steakhouse on Main Street in Gunnison – the name of the restaurant escapes me – that served all you can eat ribs one night per week. 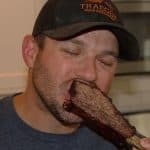 I drove back through Gunnison in 2009 on a fishing trip hoping to experience those ribs again, only to find out that the steakhouse had burned down. After I purchased my Traeger one of the first things I smoked, was a rack of baby back ribs. 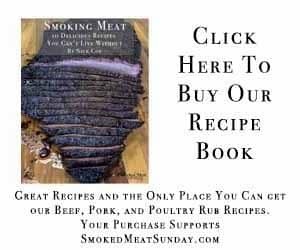 My goal has always been to replicate those amazing ribs from Gunnison, and after trying several different techniques, and rub combinations, I’ve figured out the best and most flavorful way to smoke ribs, the 3 2 1 method. The 3 2 1 method isn’t new to the world of barbecue. It’s not my idea. The difference is what I do to the ribs during each stage of cooking. You may be wondering, what is the 3 2 1 method? 3-2-1 refers to the amount of time the ribs will cook using three different techniques. During the first three hours, the ribs will smoke at 150 degrees. We will wrap the ribs with tin foil during the fourth and fifth hours of cooking, and increase the temperature of the smoker to 225 degrees. During the last hour of cooking, we will unwrap the ribs, and increase the temp of the smoker to 250 degrees. 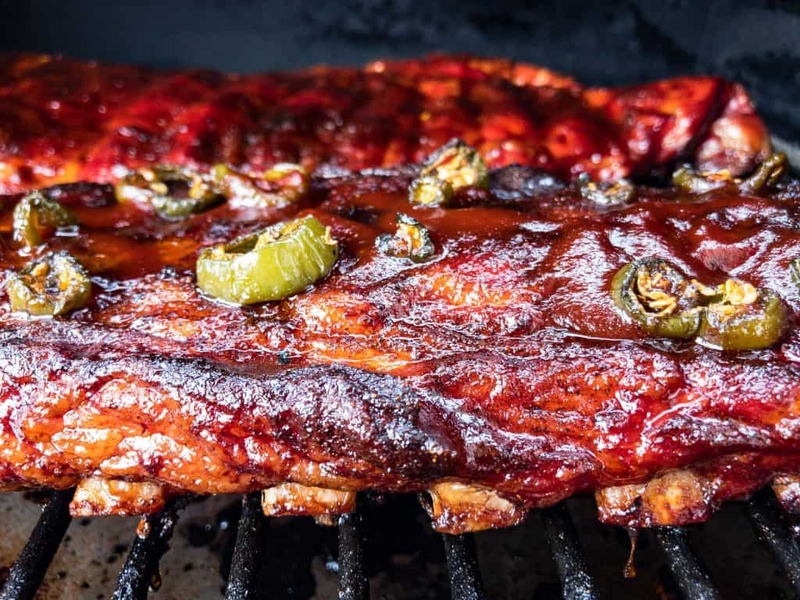 That’s the 3 2 1 method in a nutshell, but let’s get into the details of what gives these baby back ribs a punch of flavor every time you sink your teeth into them. Before we smoke the baby backs, we have to do a little bit of prep work. I typically smoke 3 racks of ribs when I make these so that I have some leftovers for my lunches during the week. When you’re ready to cook your ribs, the first thing you have to do is remove them from the fridge, and rinse and then dry, each rack. After drying the ribs flip them bone side up, and remove the silverskin. When I cook ribs using other methods I don’t remove the silverskin, but I’ve found that removing the silverskin for the 3 2 1 method enhances the flavor profile and helps the ribs absorb more of the moisture you’ll be cooking with. If you’re making these ribs, you’re gonna need an apron. Click the picture to get yours. Some people trim as much of the fat off of their ribs as they can, and if you’d like to do that, now is the time. I don’t trim any fat off of my ribs unless there are pieces of fat thicker than a quarter of an inch. Most of the fat on the ribs will melt during the cooking process. I also believe that the extra fat keeps the ribs from drying out. This step is a difference maker in my 3 2 1 method of smoking baby back ribs. Instead of applying a binding agent and a traditional rub like you would with most large hunks of meat, I apply a sauce. There are a lot of different ways to make this sauce, but my favorite concoction is one cup of apple juice, plus one-half cup of peach preserves. I add a spice mix to the sauce of one tablespoon paprika, a half tablespoon of black pepper, and a half teaspoon of cayenne. Mix the sauce until all of the preserve clumps are gone, and then brush each rack of ribs on the top and bottom. If your smoker isn’t already on, now is the time to get it going. During the first three hours of cooking your smoker temperature should be around 150 degrees. Once your smoker is up to temp add each rack of ribs, meat side up, and then close the lid. Make sure your hopper is full of pellets, and leave the ribs alone for 90 minutes. After 90 minutes of smoke, I spray each rack of ribs with some of the reserved sauce we applied at the beginning of the cook, and then leave them alone for another 90 minutes. I can’t stress the importance of a clean working space enough. After you’ve put the ribs in the smoker, don’t forget to wipe down the kitchen counter, and any other space you used to get the ribs prepped. Use a good cleaner to do this the right way. You don’t want anyone getting sick! With about 20 minutes left in the three-hour smoke period I start preparing the sauce we’ll add to the ribs for the next two-hour period. In a small saucepan over low medium-low heat combine 3/4 cup of apple juice, a half cup of peach preserves, a half cup of brown sugar, and one stick of butter. While the sauce is warming, lightly stir. You don’t want the sauce to boil, you just want the sugar and preserves to dissolve completely in the apple juice. For each rack of ribs in the smoker, you’ll want four pieces of foil that are about 4 inches longer than the rack. Put two pieces of foil down, and then slide one rack of ribs meat side down on to the foil. Bend up all four sides of the foil, and then add one-half cup of the sauce you just made to the ribs. I pour the sauce slowly onto the bones, and most of it should hold on the meat. Once the sauce is in, put the two other pieces of foil on top, and crimp the two bottom pieces of foil with the two top pieces of foil all the way around. Make sure all of your foil seams are tightly sealed and facing up to avoid spilling. Once the rack is foil sealed, put it back on the smoker. Repeat this process for the other racks you’re smoking. Turn up the heat on the smoker to 225 degrees. After adding the sauce to the foil now is also the time to add some other flavors. My favorite thing to do is slice up a jalapeno, and then put each slice directly on top of the ribs inside the foil pack. I’ve added apple slices before too, and that really kicks up the flavor. You don’t have to add anything, but if you’re cooking three racks, it doesn’t hurt to experiment with one of them. Now that the ribs have cooked for a few hours wrapped in foil, they should really be looking good. After two hours of being wrapped, carefully remove each rack of ribs from the foil pack. Put the ribs back on the smoker bone side down. Brush each rack with the sauce you used before you started cooking the ribs. If you added fruit or jalapeno in the foil pack, put those slices on top of each rack of baby backs. Turn the heat up on your smoker to 250, and let the ribs cook for an additional 40 minutes to an hour. You want the skin of the ribs to firm up, but you don’t want them to burn. If they look like they are starting to char up, pull them from the smoker. You’ll want to wrap each rack of ribs when they are done cooking and put them in a cooler to rest for about 45 minutes. After your ribs have rested, it’s time to eat. I cut my ribs into two bone portions, and serve them on a large cutting board. Serve with a good salad and bbq sauce just in case. If you followed this step by step, you won’t need sauce. What’s your favorite way to make barbecue ribs? Have you cooked them this way before? Let me know in the comments. There are few things more satisfying to a palate than fall off the bone bbq ribs. It takes time to cook a rack of baby backs the right way. 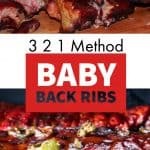 I've tried smoking bbq baby back ribs several different ways and my favorite is the 3 2 1 method. Today I'm going to share with you how I cook 321 Method Peach Peach Baby Back Ribs. Remove each rack from the fridge and rinse and dry each rack. Flip each rack bone side up and remove the silverskin. 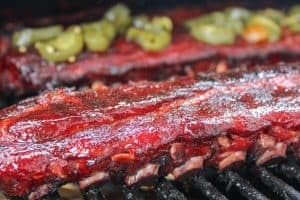 I've found that removing the silverskin for the 3 2 1 method enhances the flavor profile and helps the ribs absorb more of the moisture you'll be cooking with. Trim any fat off of the ribs thicker than a quarter of an inch. Combine starting and spray sauce ingredients and mix until all of the preserve clumps are gone. Brush each rack of ribs on the top and bottom. After 90 minutes of smoke, spray each rack of ribs with some of the reserved sauce we applied at the beginning of the cook, and then leave them alone for another 90 minutes. With about 20 minutes left in the three hour smoke period start preparing the sauce we'll add to the ribs for the next two hour period. In a small saucepan over low medium-low heat combine 3/4 cup of apple juice, a half cup of peach preserves, a half cup of brown sugar, and one stick of butter. While the sauce is warming, lightly stir. You don't want the sauce to boil, you just want the sugar and preserves to dissolve completely in the apple juice. For each rack of ribs in the smoker, you'll want four pieces of foil that are about 4 inches longer than the rack. Put two pieces of foil down, and then slide one rack of ribs meat side down on to the foil. Bend up all four sides of the foil, and then add one half cup of the sauce you just made to the ribs. Pour the sauce slowly onto the bones, and most of it should hold on the meat. Once the sauce is in, put the two other pieces of foil on top, and crimp the two bottom pieces of foil with the two top pieces of foil all the way around. Make sure all of your foil seams are tightly sealed and facing up to avoid spilling. Once the rack is foil sealed, put it back on the smoker. Repeat this process for the other racks you're smoking. After adding the sauce to the foil now is also the time to add some other flavors. My favorite thing to do is slice up a jalapeno, and then put each slice directly on top of the ribs inside the foil pack. I've added apple slices before too, and that really kicks up the flavor. You don't have to add anything, but if you're cooking three racks, it doesn't hurt to experiment with one of them. Now that the ribs have cooked for a few hours wrapped in foil, they should really be looking good. After two hours of being wrapped, carefully remove each rack of ribs from the foil pack, and put the ribs back on the smoker bone side down. Brush each rack with the sauce you used before you started cooking the ribs. 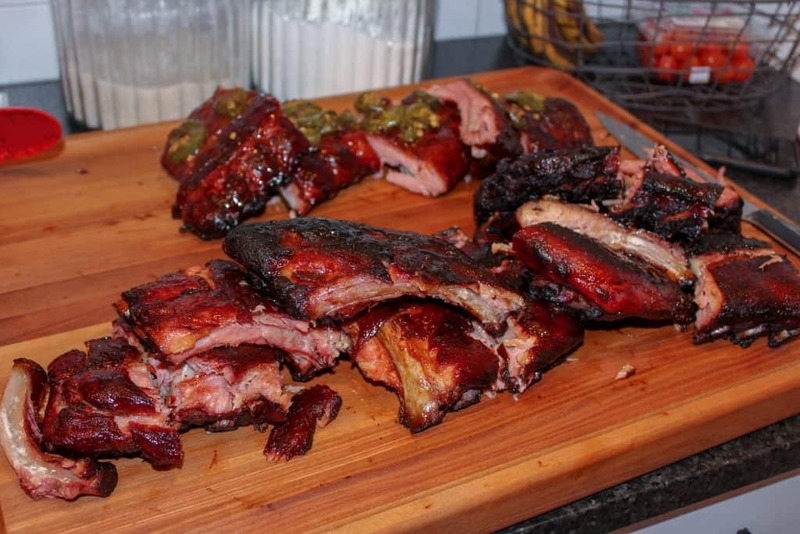 If you added fruit or jalapenos in the foil pack, put those slices on top of each rack of baby backs. Turn the heat up on your smoker to 250, and let the ribs cook for an additional 40 minutes to an hour. You want the skin of the ribs to firm up, but you don't want them to burn. If they look like they are starting to char up, pull them from the smoker, and wrap them up in foil again. 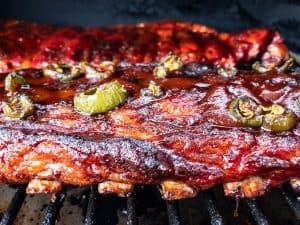 You'll want to wrap each rack of ribs when they are done cooking and put them in a cooler to rest for about 45 minutes. If you're concerned about temp, use a meat thermometer and check the temp between two rib bones. The temp should be 200 degrees. After your ribs have rested, it's time to eat. I cut my ribs into two bone portions, and serve them on a large cutting board along with a good salad, and bbq sauce just in case. If you followed this step by step, you won't need sauce. I haven’t made these yet, but the recipe sounds like just what I was looking for. I will be making these soon! 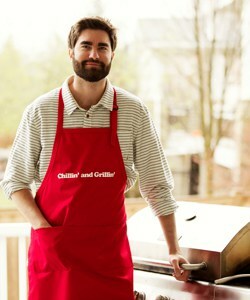 I believe the same recipe would work with saint Louis style ribs also. I may experiment by adding a couple tablespoons of jack Daniels to the sauce also!